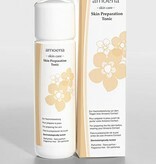 Amoena Skin Preparation Tonic products ensure gentle and thorough cleansing of the skin. They remove dead skin cells and should always be used before wearing the Amoena Contact breast form for the best adhesion. The new formulation is very mild to sensitive skin and free of preservatives, dyes and perfumes. You can use Amoena Skin Preparation Tonic in combination with all Breast Forms, Prosthetic Vaginas and Silicone Breasts!